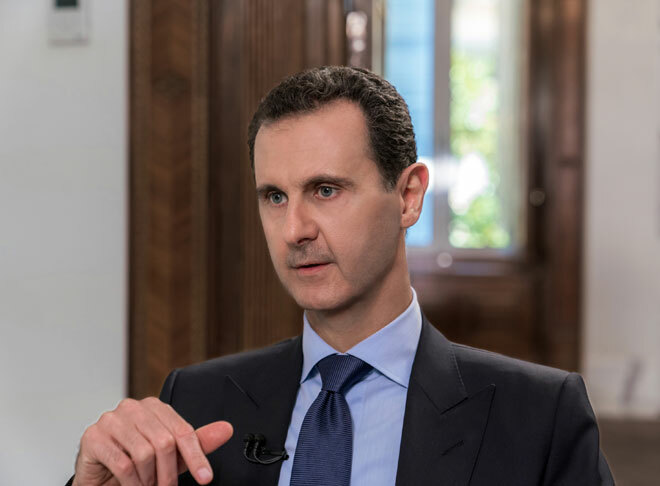 Damascus, SANA-President Bashar al-Assad affirmed that any constitutional reform in Syria should be done by a national referendum which is a wholly Syrian matter, which is in no way related to the will of the United Nations or foreign countries. 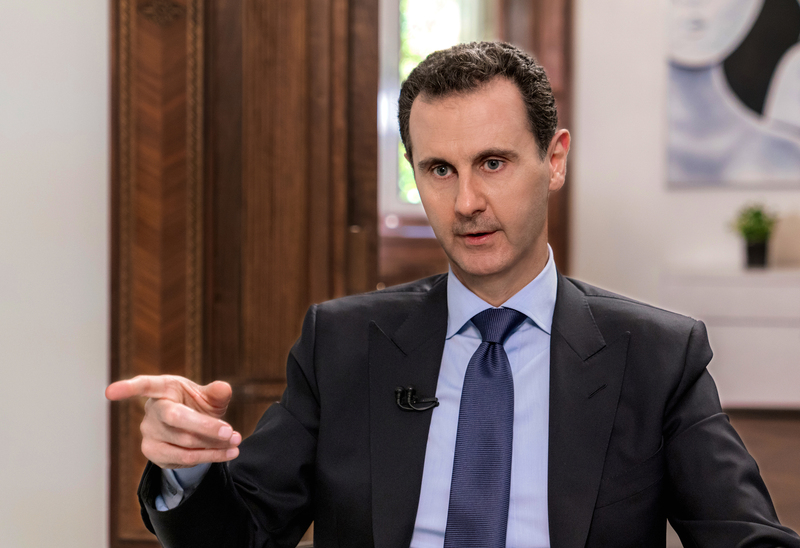 Speaking in an interview with the Russian NTV Channel, President al-Assad said the war in Syria is not a civil war but an international one from the start, pointing out that the United States wanted to redraw the world map politically and maybe militarily, with Syria being one of the key battlefields for achieving this. 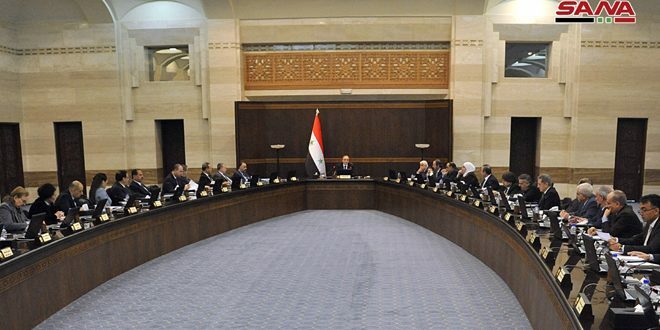 The President affirmed that the Syrian-Russian friendship dates back to six decades, describing Russia’s military and political presence in Syria and the Middle East as ‘highly important’ to preserve international equilibrium and fight terrorism. 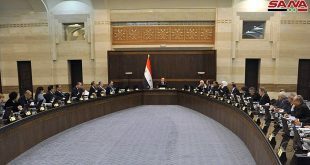 President al-Assad reaffirmed that Syria has no chemical weapons since 2013, indicating that the West invokes the chemical narrative only when its terrorist agents in Syria are defeated as a pretext for a direct military intervention against the Syrian army. 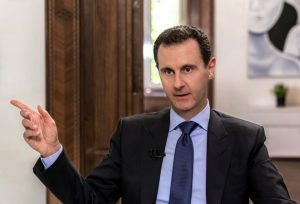 President Assad: Of course, they could have used the tools that they already had in that area, whether stolen from the government, from private companies, and so on, and they had support coming from Jordan through the desert directly to al-Ghouta, where the desert is empty, and no-one can control it or observe it, and we don’t have, of course, the means like satellites and so on to see all this. At the same time, when they started digging, they started digging under the cities, something you cannot see. Question 10: One of the main players is the United States, and Trump made his meeting in Singapore with Kim. Recently, Iran told that we will never meet with Trump because Kim is not Muslim; he doesn’t understand what’s going on, we will never talk to Trump ever. Will you, if it will be necessary, meet Trump directly or indirectly? Do you think it’s necessary for you to talk to Trump? 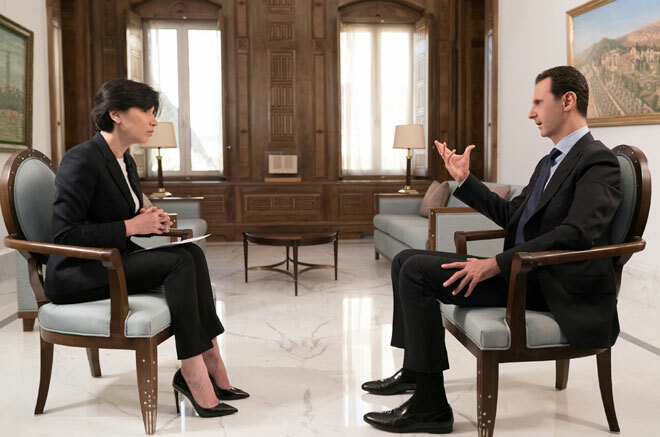 President Assad: We believe that discussing or talking or negotiating with your adversary, and any other one of course, is productive, but in this case, since we have the first negotiation with the United States in 1974, we never achieved anything in any subject. The problem with the American presidents is that they are hostages to their lobbies, to the mainstream media, to the huge corporations, financial, oil, armaments, etc. So, they can tell you whatever you want to hear, but they will do the opposite, and this is the case, and it’s getting worse and worse, and Trump is a very stark example. So, talking and discussing with the Americans now for no reason, without achieving anything, is just a waste of time. We’re not happy to talk with the Americans just because they are Americans. We are ready to discuss with anyone who could be productive, and we don’t believe that the American politics will be different in the foreseeable future. So, it’s just, again, a waste of time now. President Assad: First of all, this is ideology, this is a dark ideology that was promoted for the last five, nearly five decades – because it started in the late 60s, it’s not only in the 90s or after – around the world mainly by the Saudi Wahhabis, and of course with the support of the United States and the West in general. So, this is religious danger with political support, so it’s both. So, it’s not something spontaneous. They will return, of course, because they’re going to be used again and again by the Western powers, but maybe under different brands. Those powers were in Afghanistan thirty years ago and Reagan called them “holy fighters,” he didn’t call them terrorists. Now, they are called terrorists, but they are using those terrorists. Maybe ten years later, they’re going to be used somewhere in this world under a different brand; the same product but they are rebranding this product. So, it’s a Western tool. That’s why asking about feeling this danger is correct.